After being inspired to create my own version of Kevin & Amanda‘s Lasagna Cups a few nights back (I used all Italian sausage, and then I didn’t use shredded cheese at all, dolloping the tops with some Boursin instead), I decided to delve into my fridge to see what else I could make, since I still have a ton of Wonton wrappers left. And then it struck me. In a bit of olive oil, sweat the onions and garlic, then add the spinach, stirring it a bit to get all the leaves coated. I’ll be honest with you – I fortified the flavour here a bit and helped the spinach along by pouring in a scant amount of low-sodium chicken broth, but that’s not necessary! Put a lid on it – that’ll let the steam take charge and really facilitate the steaming process. 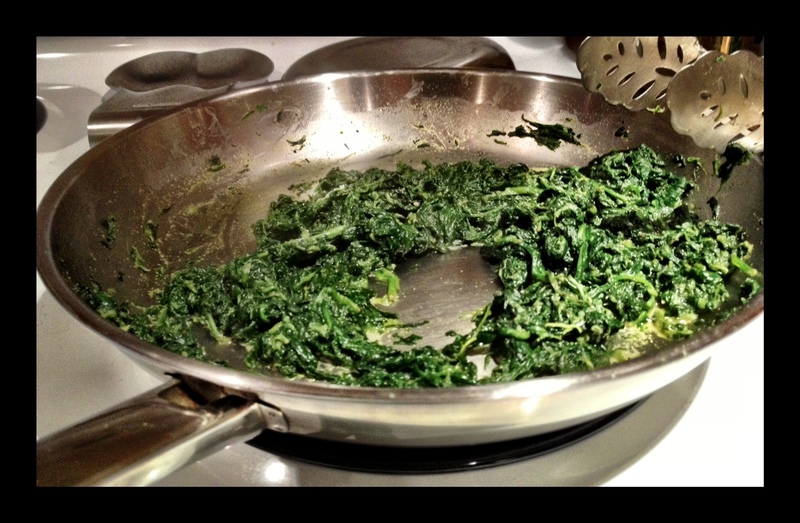 Once the spinach has wilted (it only takes a few minutes), take the lid off and turn up the heat to medium-high. This will ensure that all the liquid evaporates (no soggy wontons! ), but the flavour stays in. Season it with salt and black pepper, then transfer it to a bowl to cool. While that’s doing its magic, preheat your oven to 375 degrees Fahrenheit. Get a 12-cup muffin tin and spray it generously with cooking spray. Then, line each cup with a wonton. 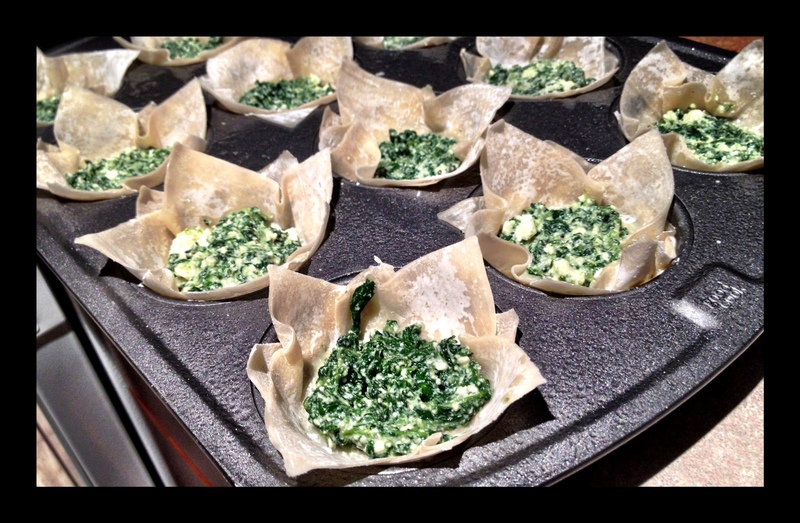 Get your cooled spinach and incorporate the cheese(s), mixing it thoroughly (I’m a dummy and didn’t take a photo). Now, traditionally, spanakopita is spinach and feta… but since the other people in this house aren’t entirely fond of its strong flavour, I used ricotta instead. 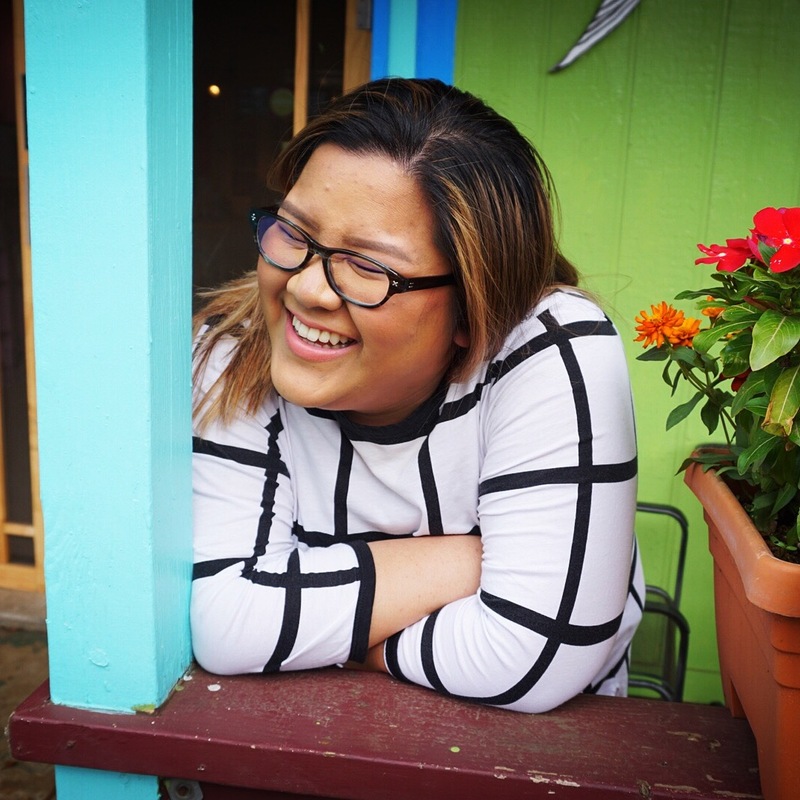 At this point, you can veer off the traditional route and add whatever you want, really. Sautéed mushrooms would be great. So would bacon, or some crumbled sausage – which I’d have totally mixed in had I not used mine up with the lasagna cups. Use your imagination! Time to fill ‘er up! You can do this one of two ways – Add a good heaping spoonful (not an exact measurement, can you tell?) 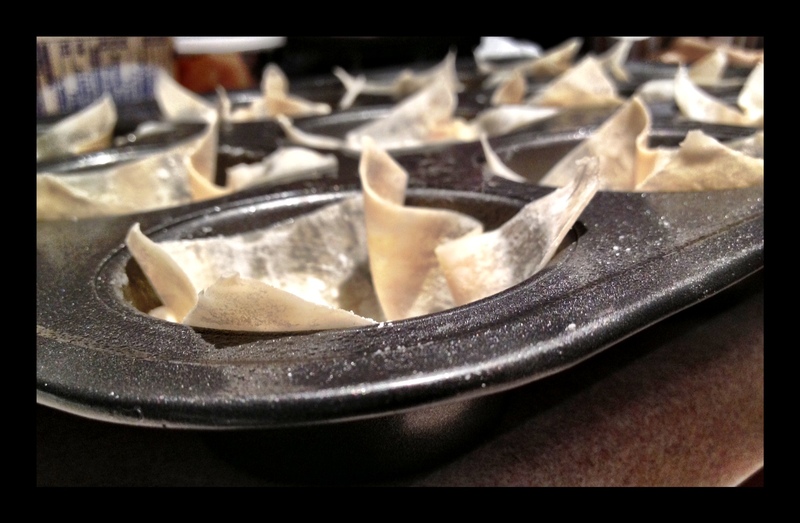 into each cup, then seal it over with a second wonton. OR you could do it layered, like I did above. I halved my spinach mixture, then with the first half, distributed amongst the cups. 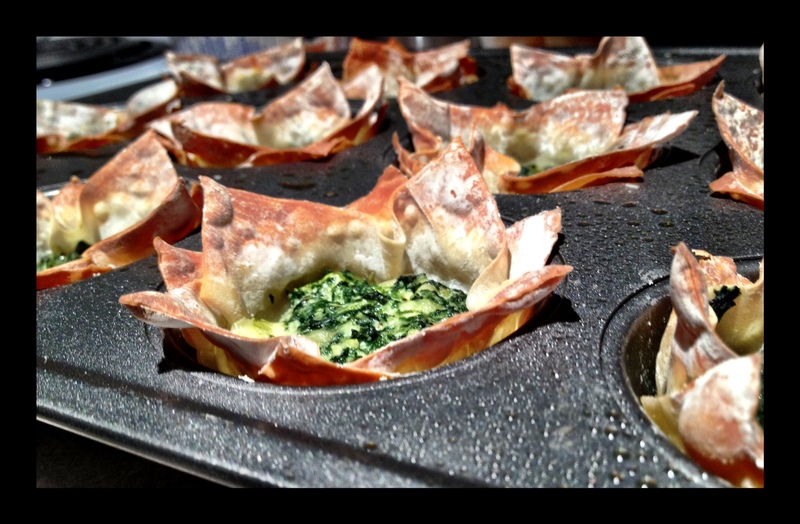 Next, I added a second wonton over top, sealing it in, then topped it off with the rest of the spinach mixture. …pick them up and chomp away! They’re so easy to make, without the hassle of dealing with fragile phyllo pastry, and without all the excess butter. 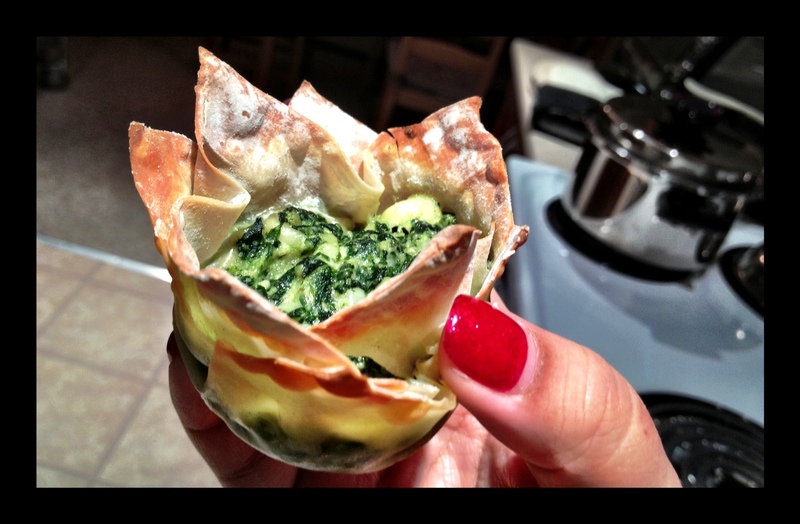 Of course, a lot of people like the buttery flakiness of phyllo or puff… but these cups are far quicker to make, and far healthier to eat, while still being crisp, flavourful, and delectable. Now, as I enjoy my last weekend before returning to work, I’ll be off with a mug of hot chocolate and a continued mission of watching Eddie Redmayne’s entire filmography with my best friend.